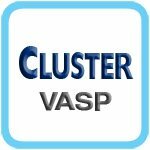 AWS Marketplace: VASP with StarCluster on Ubuntu powered by IAANSYS, INC.
VASP with StarCluster on Ubuntu powered by IAANSYS, INC.
A great VASP product, this product will allow your Cluster Computing to be 10x more productive with the click of a button. StarCluster(developed by MIT) is a utility for creating and managing computing clusters hosted on Amazon's EC2. StarCluster utilizes Amazon's EC2 web service to create and destroy clusters of Linux virtual machines on demand. IAANSYS provide prepared StarCluster image that it is ready to use for VASP(Vienna Ab initio Simulation Package) application. Easily create a cluster computing environment. The StarCluster image contains OpenMPI, ATLAS, Lapack, SGE and other useful libraries for scientific computing. Provides additional scalapack for VASP.